You are here: Home / Encouragement / Are You Successful? 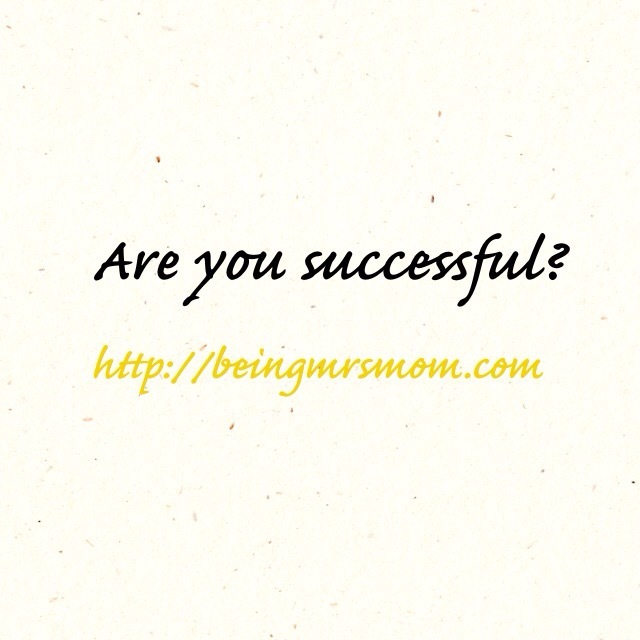 Do you feel successful? Why or why not? If you answered no…what would it mean to you if you could, honestly, say yes? For a long time, I struggled with this question. In my mind, I had always known what it was that I wanted to do and that I would be successful doing it, but as my life and the dynamic of it changed, my idea of success changed. Let me preface this… I am about to talk about something that I have not talked about publicly before, not to this degree, anyway. Ok. Now that I’ve said it, let’s get into it. For a long time, I found myself in a place where I thought I was enough. I felt capable of doing what I was called to do and I had the education to do it. However, due to what I had been taught, I went to those who were in authority for approval and, well, they disapproved. They didn’t disapprove because they had tested my knowledge or life skills. They disapproved because of two reasons. This world is full of standards, I do understand why, but sometimes those standards disqualify the very people that have been qualified by a higher power…God. On the pathway of qualifications, wordly standards crush people. In his book, “Read for your life,” Pat Williams talks about education. He says that the normal masters degree requires a student to read a minimum of 50 books on one specific topic. After reading these books and immersing herself in the topic, the student is then required to write about the topic. This writing, proves the degree to which she has learned the material. From there, an educator, who has assigned the readings, takes the writing and examines it. When this process if finished, if to the standard set, the student is given a masters degree in a specific topic. She has now been deemed an expert in her field. After reading this, I once again felt the need for validation. Isn’t that what the process of obtaining a degree is all about? However, Pat Williams put a different spin on this, without disqualifying the necessity of education itself. Before we go any further, let me ask you a question. Has your level of education had an impact on what you believe you are capable of doing? If your answer is yes, why? Keep this answer in your mind. Pat Williams said that the average American does not read at all. They spend so much time watching television and doing other things, which do not educate them, that to be an expert in a specific field, in relation to our peers, requires very little. We are going to do a little bit of critical thinking here. Make yourself a promise. Say, “I will finish reading this article.” Go ahead, say it. It will make sense in a moment. Here is A: According to the world’s standards, a person who spends time immersed in books, reading approximately 50 of them, studying, and researching a specific topic is an expert. Do you agree with that statement? Is it true or false? My answer is yes, A is true. Here is B: Statistics have shown that the majority of people in America spend little to no time reading, on any given topic. They spend more time immersed in electronic games, making a living, and social activities. Do you agree with this statement? Is it true or false? My answer is yes, B is true. Here is C: If an individual spends her time immersed in books, approximately 50 of them, reading, studying and researching a specific topic, regardless of the lack of certifying authority, she has now become an expert. My answer is yes, C is true. If we are to think on this topic logically, both the individual with the certifying authority and the one that lacks the certifying authority are experts. So why, was I so easily disqualified? It was because my expertise was not recognized. No one at the upper level of that industry had taken the time to examine my qualifications for authority. Instead they dismissed me and ultimately, I disqualified myself. What is your purpose? Why are you on this earth? Are you living out your dreams? If you answered no, why not? Have you disqualified yourself? For almost 10 years, I allowed those words to echo in my head. I felt that I was not enough. I often times attempted to convince myself that I was, but I had not been allowed to do what I was called to do because someone didn’t invest the time required to investigate my knowledge. In many ways, I felt unsuccessful. I never disqualified myself as a mother or wife. My teacher was experience and no one was going to tell me that she had not done well in teaching me the best way to be me for my family. However, this same message did not permeate into my vocational purpose until I was working on my masters degree and they told me. What did “they,” the educators tell me? They said that everything I needed to accomplish what I had been placed on this earth to do was in me. I just needed to make sure that I continued to obtain the wisdom and knowledge of those that had walked this path before. This would keep me wise and maintain my level of expertise. I needed to keep doing what k had always done. Read, research, and study. Now, in all that I have said, I am not advising anyone to out and begin practice professions in fields like psychology and medicine because someone could be hurt and it is illegal to do so without that certification. What I am saying is that it is time for you to stop disqualifying yourself based on individuals who have not checked your credentials or tested you to affirm that you are capable of walking in your purpose. It is time for you to stop questioning who you are, what you possess, and your capabilities. Stop questioning God. My journey through discovering who I am has brought me to a place where I no longer allow people to tell me something other that what God has already told me and what I know to be true. I had to decide that I am successful and no one can determine my level of success but me. But guess what!!! I am not going to stand by any longer and watch you do this to yourself. I am doing something about it. I have decided to establish a company that focuses on helping you become your best. I am taking all of the skills and resources that I am able to put together, for you. I want you to realize your value, potential, and worth. I want you to be successful so that you can do what you were put on this planet to do. That subscription is not for this blog. It is for the business that I am launching. If you would like updates on the services that I will be offering, with you in mind, subscribe. I am also preselling my course “Discovering Your Pathway to a Life of Success.” It deals with topics like this and so much more. The pre sale will end on February 29th and then the price will go up. I am only accepting 50 people, so if you want to be apart of this course, please don’t wait. I will be reaching out to everyone who signs up to find out what their struggles are, in this area. From the information that I gather from the group, I will be adding additional content to the course. What does that mean? It means that this course is different from many other courses out there. I want you to begin to grow as you find what it is that your heart has been searching for, purpose. I want you to be in a place where you are successful because you feel successful. I want you to live a Life of Success. Take a moment to review the course, Discovering Your Pathway to a Life of Success and if you know someone who could be helped by it, share it with them. Thank you for taking the time to read this. I hope it has blessed you and I pray that God would continue to give you all that you need to keep moving forward.